Please join us to celebrate our non profit status, and THREE years of making art and community, curating dynamic performances, bringing international guest artists to share work with our local community, building an amazing school and resource for local artists, and of course, offering movement training to youth and adults! 6PM: YOUTH SHOW- with Hatchery and the Hatchlings and special guests! 7-8:30: PARTY AND INSTALLATIONS- Live Music with Brooke Bateau! Free local food and drinks for all! Installation performances! 8:30-9:30: SCDT Showcase featuring Dante Brown, Chris Aiken, Alex Springer and Xan Burley, and Jen Polins with Stephen Katz. 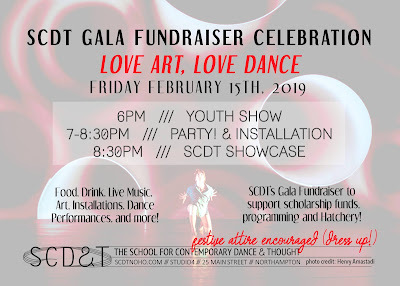 The fundraiser will support scholarship funds to make SCDT programming accessible to ALL, scholarship funds for Hatchery, the pre professional dance company of SCDT, and for international programing! As you know, SCDT has been serving as a center for performance art while the Arts Trust at 33 Hawley st. was under construction. Now we are collaborating with A.P.E. @ Hawley, expanding programming to both spaces and continuing efforts to grow the arts community. 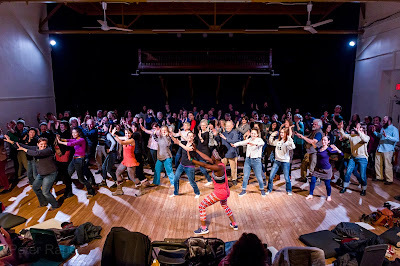 SCDT has hosted over 200 artists in the past 3 years, we have started programming that supports the development of local artists, we have starts a thriving teen dance company that will be performing at Jacob's Pillow this summer for the second time, we have a vibrant school that offers classes to all ages, and we have been defending THE LAST HISTORIC LARGE PERFORMANCE SPACE in Northampton.